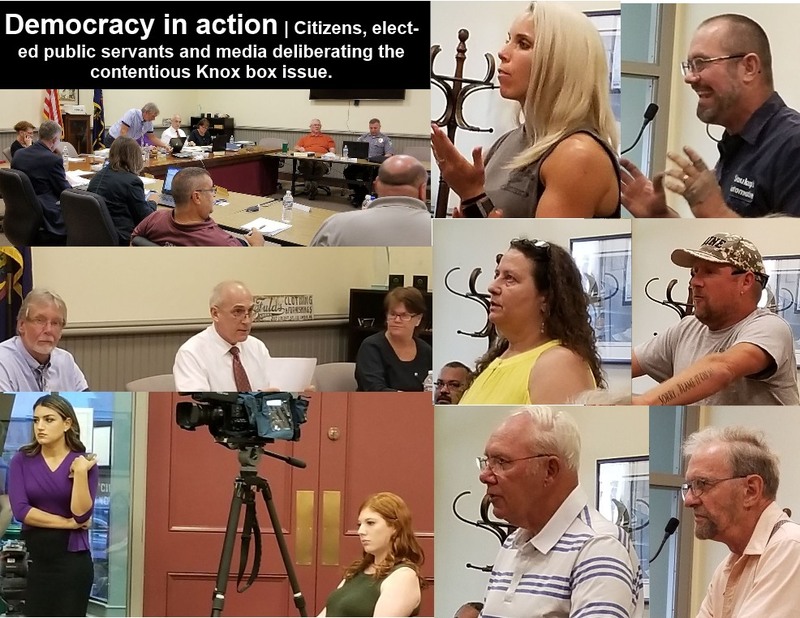 Last night’s Legislative Committee meeting attracted a couple dozen citizens and at least two TV news resources; the majority of the citizens were there to voice their concerns about the borough’s Knox Box compulsory installation as outlined in this ordinance: Ordinance 891- Fire Co Consolidation. § 74-15Key lock box required. Commercial or industrial structures protected by an automatic alarm system or automatic suppression system, or such other structures that are constructed in a manner that restricts access during an emergency as shall be determined from time to time by the Fire Chief. Multifamily residential structures that have restricted access through locked doors and have a common card for access to the living units. § 74-16Time period for installation. All newly constructed structures subject to this article shall have the key lock box installed and operational prior to the issuance of an occupancy permit. All structures in existence on the effective date of this article and subject to this article shall have one year from the effective date of this article to have a key lock box installed and operational. § 74-17Designation of key lock box system. The Fire Chief of the Borough of Columbia shall designate the type of key lock box system to be implemented within the Borough of Columbia and shall have the authority to require all structures subject to this article to use the designated system. The owner or operator of a structure required to have a key lock box shall, at all times, keep a key in the lock box that will allow for access to the structure by the Fire Chief, and emergency fire personnel, Police Chief of the Borough of Columbia, and police personnel. § 74-19Rules and regulations to be implemented. The Fire Chief shall be authorized to implement rules and regulations for the use of the key lock box system, which rules and regulations shall be posted on the website of the Borough of Columbia. § 74-20Required information for certain facilities. A current list of key facility personnel knowledgeable about safety procedures for materials on site, complete with telephone numbers for such personnel in the event of an incident after normal hours of facility operation. A current emergency and hazardous chemical inventory form and a binder containing the material safety data sheets, or in the event that the volume of the material safety data sheets is too great to keep practically in the repository container, shall give the location of the on-site material safety data sheets, and the material safety data sheets shall be readily available for use by emergency response personnel. A facility site plan, including the location of storage and use of hazardous materials on site, the location of on-site emergency firefighting and spill cleanup equipment, a diagram of the complete sewer system and water system, showing fire hydrant and water main locations and sizes, and any building floor plan deemed necessary by the Code Official. The key lock box shall be installed at a location designated by the Code Official and shall be identified in a manner described by the Code Official, or in the alternative, designated and identified by the Fire Chief. All key lock boxes shall have a minimum interior of 14 inches high by 12 inches wide by two inches deep, except where a smaller key lock box is deemed adequate by the Fire Chief and/or Code Official. § 74-23Documents to be updated. The owner or operator of the facility shall update the appropriate documents within the key lock box on an annual basis, or more frequently when deemed necessary by the Fire Chief and/or Code Official, and shall send the Fire Chief and/or Code Official all of the updated material, including an updated copy of the emergency and hazardous chemical inventory form, which shall be placed in the key lock box as well as disseminated among the emergency response personnel, including members of the Police Department. Whoever violates any provision of this article regarding key lock box requirements shall, upon conviction in a summary proceeding, be sentenced for each violation to pay a fine of not more than $600, together with costs of prosecution for each violation, and, in default of the payment of such fine and costs, to undergo imprisonment for not more than 30 days. Each violation of any provision of this article, and each day that such violation shall exist, shall constitute a separate violation and offense. Any person who violates any provision of this article may have their permit to use an outdoor fire device suspended or revoked by Columbia Borough Council, in the Council’s sole discretion. Previous Wonder if? TV cameras will be at tonight’s Legislation Committee meeting 6:00 pm, August 8, 2018? Will you?